Issues Of The Environment: How 'Green' Is Your Christmas Tree? Finding the right Christmas tree for your home is always a big part of the holiday season. But which type of tree is better for the environment--real or artificial? In this week's "Issues of the Environment," WEMU's David Fair tries to settle this debate with Michigan State University horticulture professor Dr. Bert Cregg. Christmas trees are big business in Michigan. According to the Michigan Christmas Tree Association, Michigan is the third largest producer of Christmas trees. There are approximately 2 million trees sold in Michigan, and for each tree cut, three are planted. Michigan generates $27 million from trees and $1.5 million from garlands and boughs. What type of Christmas tree you choose plays a very small role in your overall carbon footprint, but pondering the best choice is an excellent exercise in what to consider when making environmentally responsible choices as a consumer. 45% of Christmas trees purchased in 2017 were artificial, and the share is growing. Are fake trees bad for the environment? Are real trees a better choice? According to Dr. Bert Cregg's analysis, “Which option “wins” in terms of carbon footprint depends entirely on assumptions about how long consumers would keep an artificial tree versus how far they would drive each year to purchase a real tree.” (see analysis below for details.) The takeaway is that for real trees, the fuel use associated with driving to cut down a tree is only somewhat offset by the carbon sequestered by the tree and its roots. For synthetic trees, which are mostly imported from China, transport is a factor. The Michigan Christmas Tree Association reports that because trees take nearly a decade to be ready for harvest, there are fewer live trees available this season than in the past, mostly due to the Great Recession, and there will be more trees in the coming decade. 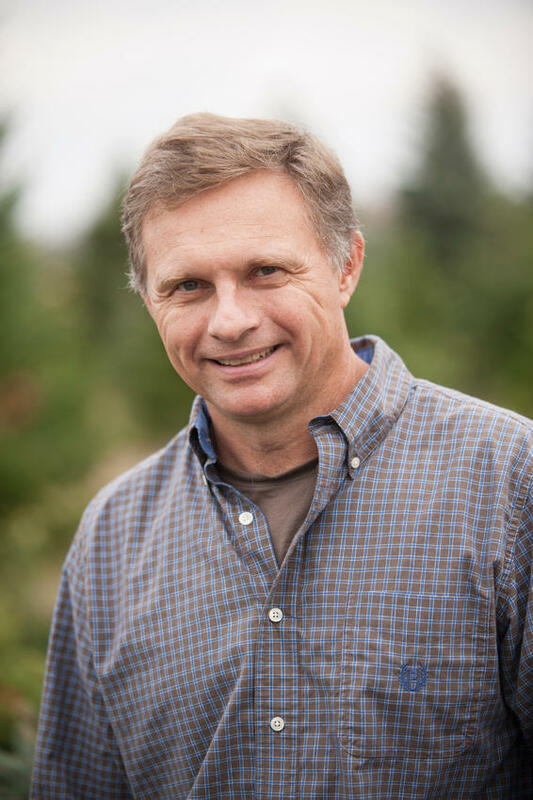 Dr. Cregg, Professor of Horticulture and Forestry - Michigan State University, employs a method called life cycle assessment to develop a “cradle to grave” accounting of inputs and outputs required to produce, use and dispose of Christmas trees. He is considered Michigan’s preeminent Christmas tree and tree farm expert. Environmentally conscious consumers often ask me whether a real Christmas tree or an artificial one is the more sustainable choice. As a horticulture and forestry researcher, I know this question is also a concern for the Christmas tree industry, which is wary of losing market share to artificial trees. And they have good reason: Of the 48.5 million Christmas trees Americans purchased in 2017, 45 percent were artificial, and that share is growing. Many factors can influence this choice, but the bottom line is that both real and artificial Christmas trees have negligible environmental impacts. Which option “wins” in terms of carbon footprint depends entirely on assumptions about how long consumers would keep an artificial tree versus how far they would drive each year to purchase a real tree. To estimate the total impact of something like a Christmas tree, researchers use a method called life cycle assessment to develop a “cradle to grave” accounting of inputs and outputs required to produce, use and dispose of it. For natural Christmas trees, this covers everything from planting seedlings to harvesting the trees and disposing of them, including equipment use, fertilizer and pesticide applications, and water consumption for irrigation. Life cycle assessments often will also estimate a system’s carbon footprint. Fuel use is the biggest source of greenhouse gas emissions in Christmas tree production. Using 1 gallon of gas or diesel to power a tractor or delivery truck releases 20 to 22 pounds (9 to 10 kilograms) of carbon dioxide into the atmosphere. On the positive side, Christmas trees absorb and store carbon from the atmosphere as they grow, which helps to offset emissions from operations. Carbon represents about 50 percent of the dry weight of the wood in a tree at harvest. According to recent estimates, Christmas tree-sized conifers store roughly 20 pounds of carbon dioxide in their above-ground tissue and likely store similar amounts below ground in their roots. However, using 1 gallon of gasoline produces about the same amount of carbon dioxide, so if a family drives 10 miles each way to get their real tree, they likely have already offset the carbon sequestered by the tree. Buying a tree closer to home or at a tree lot along your daily commute can reduce or eliminate this impact. Recently, the American Christmas Tree Association, which represents artificial tree manufacturers, commissioned a life cycle assessment comparing real and artificial Christmas trees. The analysis considered environmental aspects of sustainability, but did not examine social or economic impacts. Consumers can’t affect how farmers grow their live trees or how manufacturers produce artificial versions, but they can control what happens after Christmas to the trees they purchase. For artificial trees, that means reusing them as many times as possible. For natural trees, it means recycling them. This is essential to optimize the carbon footprint of a real tree. Grinding used Christmas trees and using them for mulch returns organic matter to the soil, and can contribute to building soil carbon. Many public works departments across the United States routinely collect and chip used Christmas trees after the holidays. If local tree recycling is not available, trees can be chipped and added to compost piles. They also can be placed in backyards or ponds to provide bird or fish habitat. Michigan is third in the nation for harvesting Christmas trees, with 27,000 commercial acres of growing Christmas trees. There are approximately 2 million trees sold in Michigan, and for each tree cut, three are planted. Michigan generates $27 million from trees and $1.5 million from garlands and boughs. “There’s a whole market to all those products, also,” said Amy Start, executive director for the Michigan Christmas Tree Association. Her organization has 120 members currently, which primarily grow Christmas trees. These include nurseries, farms and wholesalers. Over the past 10 years, numbers have declined. She said younger people aren’t getting into farming, and the recession forced a lot of farms out of the business. “It breaks my heart,” she said. This means that there are fewer trees to buy and to choose from this season. “We’re seeing that effect now, seeing a tightening of a market nationwide,” she said. “It’s not tremendous, but there are fewer Christmas tree growers than there used to be,” said David Petts, owner of Branching Out Nursery and Landscaping in Fenton Township. There were fewer trees planted around the time of the Great Recession, which can take eight to 10 years to grow. “For the next few years there are going to be fewer trees than you’re used to,” he said. This just means that growers like Petts will have fewer options to offer buyers. They may have to compromise on their purchase. He said that in the past, excess trees were sometimes sold to non-profit organizations for their fundraiser. Petts hasn’t had excess for a while, so he hasn’t been able to sell anything wholesale. In a few years, there will be more excess, and more choices for consumers. He thinks any shortage will be at its worst this year. Other nurseries have closed, and he’s absorbing those clients, leading to more sales and fewer trees. Petts said the white fir is growing in popularity and is starting to replace the blue spruce in popularity. Overall, the Frasier fir is still king. Petts said there’s no average order size or tree. It depends on the space, and the needs of the consumer. Some trees have weaker boughs that can’t handle a lot of ceramic ornaments. “Just understand how you decorate,” Petts said. A white pine, for example, will last until spring but can’t handle heavy ornaments. Firs and spruce trees can better handle heavier ornaments, he said. Someone with a smaller home will seek a tree appropriate for the space. Some people want a 3-foot tree while others want a 16-foot tree. Environmentalists contend the ongoing, lame-duck session of the state Legislature is proving detrimental to health of “Pure Michigan.” In the December edition of WEMU’s "1st Friday Focus on the Environment," David Fair explores measures that could strip away wetlands protections and measures that could keep the nearly 70-year old Line 5 pipeline operational in the Straits of Mackinac for another decade. Michigan League of Conservation Voters executive director Lisa Wozniak and Tip of the Mitt Watershed Council policy director Jennifer McKay join in with their perspectives. Amid PFAS contamination, controversial oil and gas pipelines, and lead contamination, another water safety issue in Washtenaw County sometimes drops out of the public discourse. The expanding 1,4 dioxane plume in the Ann Arbor area has again reared its head. In this week's "Issues of the Environment," WEMU's David Fair talks to Washtenaw County Water Resources Commissioner Evan Pratt about the steps being taken after recent testing revealed much higher levels of the chemical in the waters in Ann Arbor's West Park. The recent wildfires in California captured the world's attention, including those researching climate change. In this week's "Issues of the Environment," WEMU's David Fair talks to one such researcher. Dr. Jonathon Overpeck is the Samuel A. Graham Dean of the School for Environment and Sustainability at the University of Michigan. They discuss the connection between wildfires and climate change and why there is increased risk in Michigan.